The Pacific is a television show in the War genre starring Joseph Mazzello, James Dale, and Jon Seda. The tv show first appeared on air on 2010-03-14. Our users found the overall impression of this television show to be Educational. The tv show's official site can be found at www.hbo.com/#/the-pacific. "The Pacific" tells the true story of the American men and women who experienced the Pacific Theater of Operations during the second World War (i.e. the battles that took place in and around the Pacific Ocean during World War II). 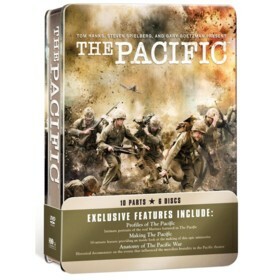 The show stays true to its source material - The Pacific pays an amazing attention to detail to every aspect of the War. In my opinion, this sort of historical accuracy has only been matched by the earlier 2001 series, "Band of Brothers". This is to be expected considering the people behind both shows is largely the same and because both series were produced by the legendary Steven Spielberg and Tom Hanks. I am tempted to say that Band of Brothers was a slightly better show but also feel that the two series should not really be compared as the Pacific and Atlantic Theater of Operations are so different in their execution and the strategies that were employed - so I will simply say that both series are excellent. The production values of the The Pacific are so spot on that I actually cringed during some of the scenes due to their authenticity. That being said, this show is definitely not recommended for a younger audience as it showcases the many brutalities of war in sometimes gruesome detail. Overall this is an outstanding miniseries that deserves to be watched. It does an exquisite job of highlighting what American Marines went through in their War against Japan. I recommend it to history buffs and movie fans alike due to its amazing production values and stellar cast - the story, acting, music, everything is at an extremely high standard. The Pacific is one of the best showcases of the horrors of World War II ever created, on television or on the big screen.